Jonathan Edwards signed 6x4 inch promo card. Jonathan Edwards, signed 6x4 inch promo card. 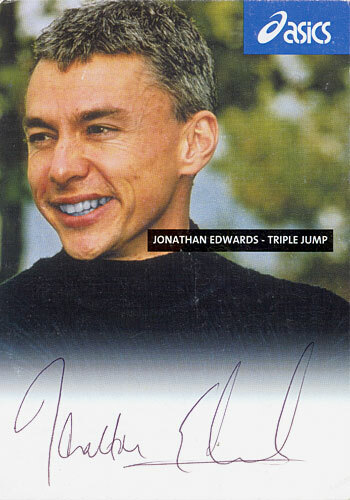 6x4 inch promo card personally hand-signed in black biro pen by English triple jump legend, Jonathan Edwards. Edwards is a former Olympic, Commonwealth, European and World champion, and has held the world record in the event since 1995. He won a gold medal at the 2000 Olympics in Sydney. Supplied with a Certificate of Authenticity.